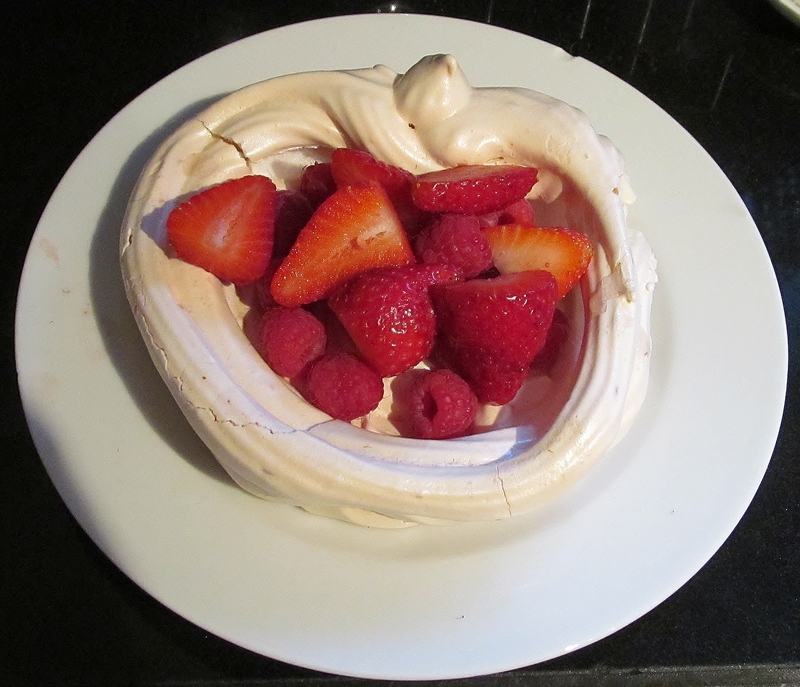 Week eighty already and I didn’t know what I fancied attempting this week – sweet or savoury? 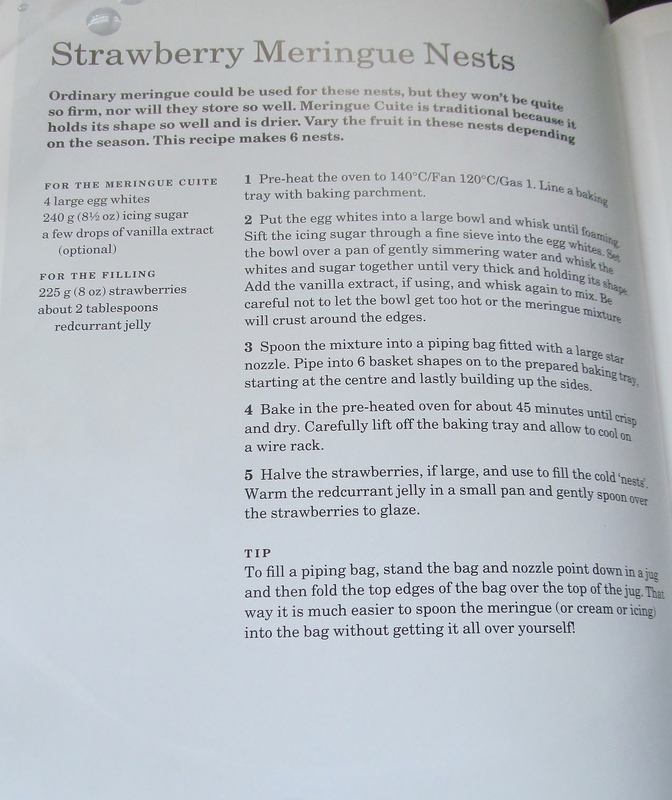 I dipped into Mary Berry’s Baking Bible and surfaced with strawberry meringue nests and rock cakes! 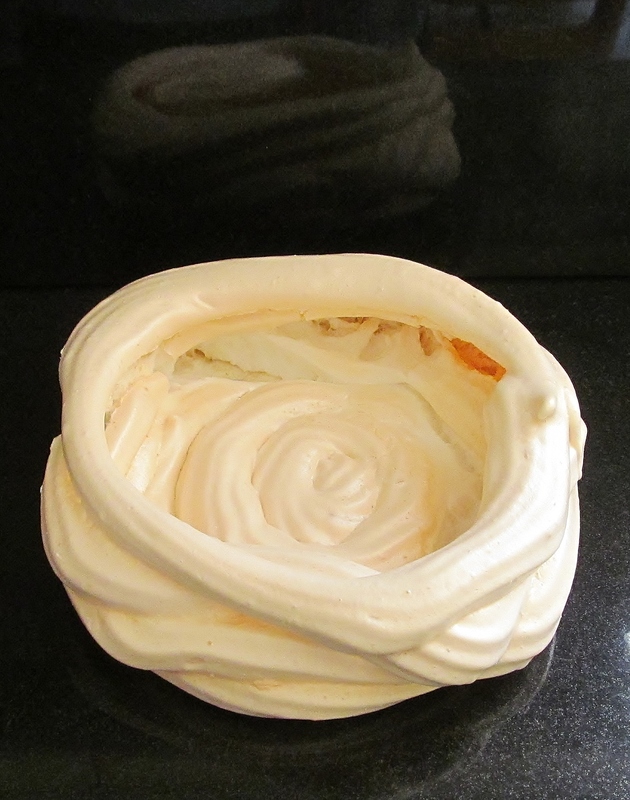 The meringue nests would make a nice pudding after the planned weekend b-b-q and so I began. Mary asks you to whisk the egg whites until frothy. Then you add the icing sugar but interestingly Mary then asks you to whisk the mix over a pan of hot water until the mixture is stiff and ready for piping. No easy feat but I had a pan of hot water on anyway boiling some eggs for a salad so I used that pan and juggled the bowl over it while whisking until I thought it was set…… then Mary asks you to put the mix into a piping bag and pipe into basket shapes. Mary estimates that the mix will make 6 baskets but mine made four- they were huge though! My piping skills obviously need a lot of practice ! I was ok with the base but when it came to the basket sides, I wobbled all over the place! When all were piped, they had to go into the oven for about 45 minutes. Once cooked and cooled, Mary asks you to put strawberry pieces in and glaze with some melted strawberry jam. This is where Mary and I agree to disagree as I am a purist with strawberries and thought they didn’t need to be spoiled with a glaze. I also added some raspberries and served in the basket with some cream. 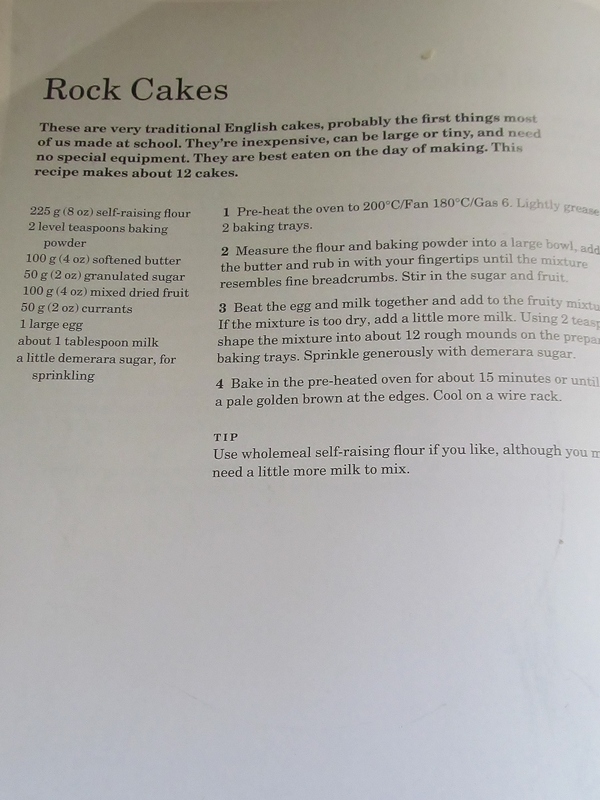 The second recipe was rock cakes. 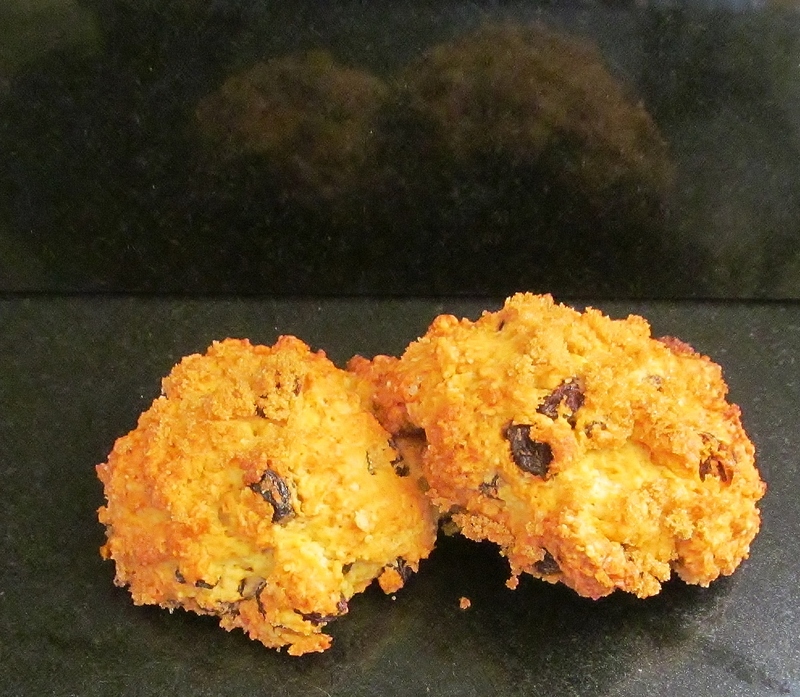 The last time I made rock cakes was when I was in home economic classes at school. Mary asks you to weigh out the flour and add the butter , rubbing it in until it resembles breadcrumbs. Then add all the other ingredients and mix together. Use 2 teaspoons to put amounts of the mix into small heaps on the tray and sprinkle with brown sugar and bake for 15 minutes. The finished cakes kind of resemble rocks I guess. All I can say is that they tasted good!! Well the countdown continues with 108 recipes left to bake…. This entry was posted in Kim's cake challenge and tagged Baking Bible, Kim's rock cakes, Kim's strawberry meringue nests, kims cake challenge, Mary Berry, Mary Berry's Baking Bible, Mary Berry's Rock Cakes, Mary Berry's Strawberry Meringue Nests, meringue, rock cakes, Strawberry by kimsideas. Bookmark the permalink. Superb, what an indulgence. Have now got to start the diet in ernest. Will have to give up tasting!! !